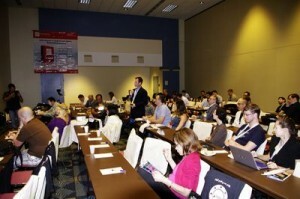 On 22-23 of June, 2012 I have attended iDate conference in Los Angeles. It’s been our third time at Internet Dating Conference in Beverly Hills. PG Dating Pro software was one of the event sponsors – Dating Industry Sponsor. 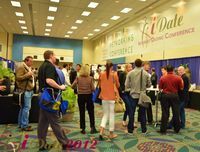 This year the event gathered more than 200 professionals in online dating industry. There were a lot of new faces and some of them were new customers of Dating Pro. This year iDate in Beverly Hills was devoted to mobile dating and related technologies. There were a lot of lectures worth going: about building mobile apps for dating, seo tools, mobile marketing. Bing and Google spoke about search engine tools for mobile dating sites, Brian Bowman from Complete.me reviewed mobile dating future, Mark Brooks provided a review on the state of mobile dating with video interviews of main service providers. An exciting topic of monetizing couples was covered by Dwipal Desai, the owner of “The icebreak”. There were a lot of insights on the direction of online dating industry: we need to help site owners to retain users longer at a dating site, offer more services and monetization tools on the web and mobile apps. Therefore we need to offer some social dating options for couples and singles. I loved the “CEO Therapy” session: the 3 startups FlickDate, Link4Love and MiniDates. The 3 companies made a 5 minute presentations on the essence of their business model. Then the audience would give them their advice and appraisal/critics. Another new panel made everyone listen very carefully. It was Julie Spira with her “user group”. Just to clarify, “user group” consisted of 5 users of mobile dating sites who for 3 months were using various mobile dating sites and apps. At iDate they shared their experiences and gave a lot of valuable pieces of advice to all CEOs in the industry. It’s funny that most of them said that mobile dating experience was neither successful nor pleasant to them. One guy actually tried online dating for the first time for iDate. I also enjoyed a session on infographics and their impact in online marketing. And, as usual, great networking meetups and parties, as well as delicious food made iDate event very delightful. I met some Dating Pro’s new customers. It was a pleasure to see each other and hear suggestions and feedbacks. We also reconnected with our partners: payment systems and service providers. We saw a lot of interest in our dating CMS, made some demos and private meetings. All badges had Dating Pro inserts and it was easy to communicate with everyone. No explanation of our business was needed. On June 22 there was a great party in Beverly Hills. A lot of fun and networking opportunities. After all was over I had some solutions on mobile dating in place, a bunch of valuable contacts and great 2 days in Beverly Hills! I was also tired of networking with people and took a day off to understand and research everything I have learned to be able to apply it for Dating Pro, its mobile module and general software development. Very soon those decisions will be live on Dating Pro software. Feel free to follow us and send us your feedback. If you are planning to go to next iDate conference in Germany, let me know and we can meet.